I began the lessons with a student evaluation that I built in Google forms. Student evaluation does not necessarily have to happen only in a digital classroom. But applications yielding instantaneous compilation of evaluations in order to reorganize lessons to fit needs of students is of infinite value. Upon entrance to the classroom students scanned the form with their QR readers and took their time responding. Prior to iPads, students would enter the classroom and reluctantly approach routine tasks. Whether it is the novelty or ease, iPads establish an efficient workflow that is yet unmatched. Student surveys yielded requests for continued CLOZE activities, word banks and study guides added to folders in Notability. They indicated a need for interactive notebooks that could be accessed while taking quizzes and tests. I allowed this on a compare and contrast essay. The results of the timed essay assessment rely on how they synthesized their access to knowledge not on recall alone. The result was an increase in attempts to include specific evidence. Assessments and evaluations confirmed that students were confused on historic content of Parliament’s development over time. I took one step backwards to address misconstrued understandings of the rise of Parliament in Stuart England. I reorganized the lesson to balance content with analysis of perspective, acknowledging that the internet is abundant with resources. We started with a compare/ contrast template listing models of leadership over time through to current of heads of state. We then balanced my requirement of using our libraries databases with student requests to use search engines freely. Co-teaching in the library gave students individual time with one of three adults who could personally direct them to appropriate sites and resources. It was exciting to circulate throughout the comfortable spaces in the library and find numerous students engaged in deep reading, copying notes directly into interactive notebooks. Acknowledging student input led to “buy in” with attentions directed towards creation applications. Our goal was to present a synthesis of findings on world leaders through the design of playing cards or baseball cards. A brief lecture about copyright violations established clear parameters; images of leaders would not be simply copied from the internet and pasted. Several students helped me present iPad’s simple screen capture by pushing down the power button and the home button at the same time, automatically saving to the camera roll. A manipulation of this image would express understanding of a leader’s past if they included icons, symbols or collages in their design. 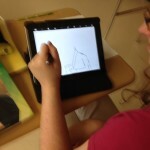 Most students were familiar with Picollage but hadn’t considered using Sketchpad, drawing tools in Notability or Pages. I presented a simple illustration of me embedded in of a drawing of a viking made in Sketchpad in less than 10 minutes. Lack of artistic ability or speed of production inspired rapid experimentation. Completed works were saved to Notability as a first creation in their interactive notebooks. Next week, I will teach them to send them through Haiku, my online platform as a pdf. Already students are discussing how they will create a similar interactive notebooks for other independent studies. My husband, the visionary technology integrationist behind the rollout, affirms allowing student choices for applications and class time to experiment as key to classroom management. Students are happy, working at their own pace, forgetting to stand by the door and wait for the bell.